We have pets, actually we have hundreds, maybe thousands of them. No I haven’t relocated to my dream country cottage with hobby farm and no I haven’t moved to a zoo. Are we busy? Not really, just the usual, work, play, gardening, yoga. Curious? Well, I’ll tell you. 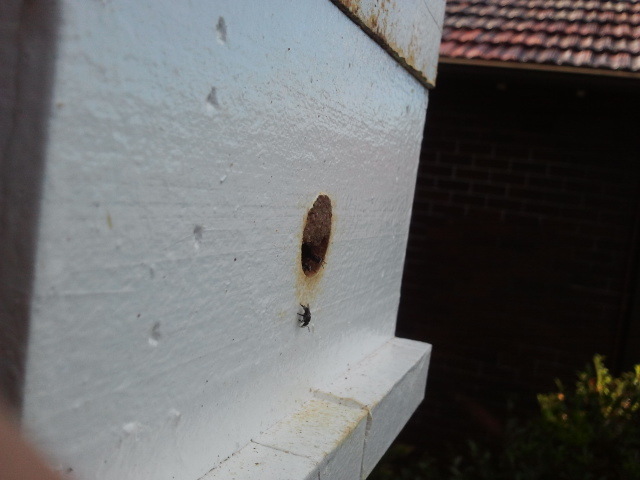 We have a colony of native stingless bees living in a purpose-built hive on our sunroom windowsill. 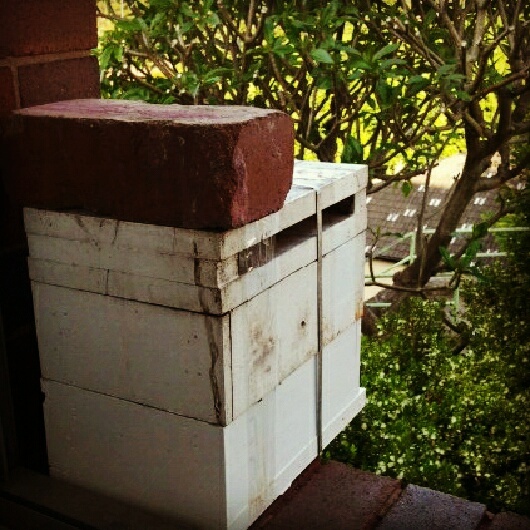 My husband has wanted a stingless bee hive for many years now. A friend of ours who has had native stingless bees for a number of years offered to split his hive with us. “the splitting method of propagation involves dividing the hive horizontally at its midpoint and equipping the old top part with a new empty bottom and the old bottom half with a new top. The bees are then left to furnish their new basement or attic depending on which side of the split they find themselves”. Taken from p60 of Australian Stingless Bees A Guide to Sugarbag Beekeeping by John Klumpp. The Queen is left on one side and as long as there is a viable queen in the other side of the split, the new colony will be successful. So, early one Saturday morning before the day got too hot, Dave went to collect his new hive. Sorry, Dave didn’t take any pictures of the split, I think the upheaval of happy bees and the splitting of the colony was all a little to much to capture. Fast forward two months and the bees are happy in their new home and position. We have put the hive on our sunroom windowsill (outside of course) with the tiny opening facing east so that it gets the first sun in the morning. What’s not to love about that situation? You can see the opening of the hive. 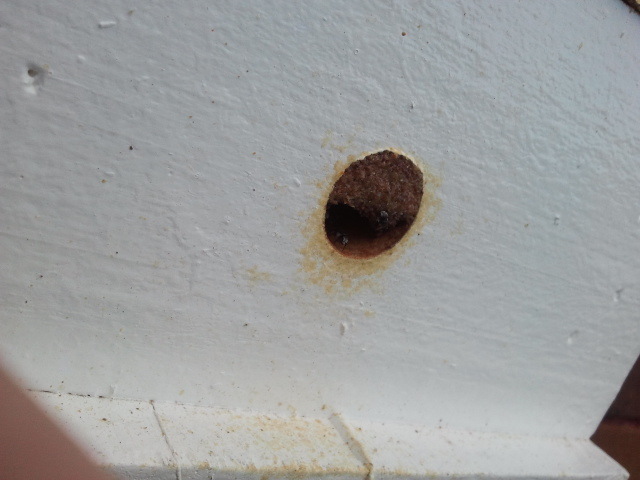 The bees have put resin on the top half of the opening since being here and the yellow around the opening is pollen. They are the most delicate little things you can imagine. Ok, I’m sure you can imagine a far more delicate ‘thing’ than an insect but trust me, they are cute and tiny. If they are flying solo you have to look closely to see them. One day not long after we had them I walked in front of the hive, to be honest I forgot they were there but I could feel these little things touching my arm, like they were flying into me and pinging off me in all directions. Instantly I remembered them and stopped but they just kept pinging. I held out my hand hoping some might land but they weren’t interested in that. So cute! I promise no bees were harmed in the construction of this paragraph. Here is the openging of the hive, if you look closely you can see a bee underneath the opening and you can see some just inside too. To give you an idea of the size of the bees, the opening is about 1.5cm diameter. It seemed to take the tiny bees a few weeks to settle in. We often saw them swarming at the front of the hive (that is what I walked into). Perhaps they were voting for their new Queen and having a few heated discussions, we aren’t sure why they were swarming. But I think they were settling in and arranging their hierarchy. Thankfully that behaviour has stopped and we just see them coming and going now. The bees are most active during the morning, but we do see them coming and going throughout the day. This will be their busiest time of year while the weather is warm, because they avoid flying when the temperature drops below 18˚Celcius. Even during December when we had a few cool days (a rainy, cool Christmas day for example) they were nowhere to be seen. I guess that leads us to your burning question, what about the honey? Well, our tiny bees do produce honey, but no, we do not harvest it. You see, they don’t make a lot of it and what they do make they store and use during winter when they can’t leave the hive. This prompts another question, what’s the point of having bees if we don’t harvest the honey? We have the bees to help with pollination of our plants, our neighbour’s plants, the street plants and maybe even plants in your garden. The Australian bee population, both native and Australian, is in decline. Without bees there is decreased pollination of our flowering plants which results in less fruit and vegetables. 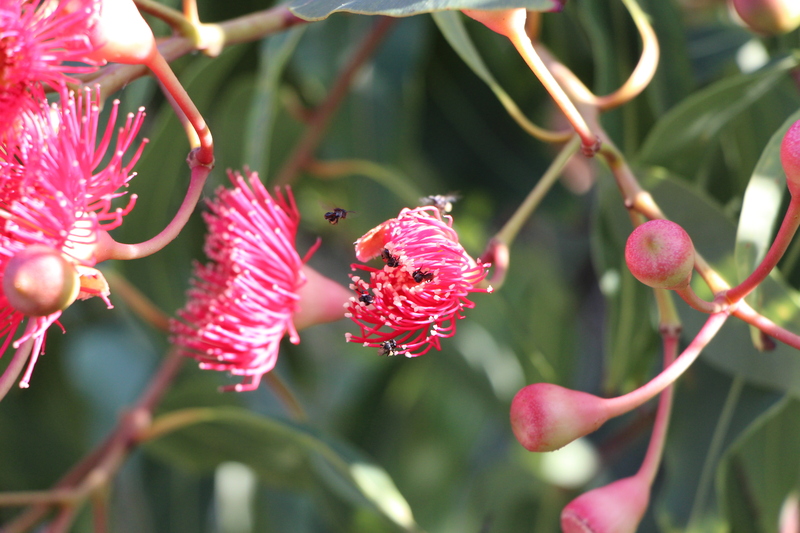 A pink flowering gum with some visiting Sugarbag bees. So apart from providing us with so much joy and fascination as we watch them leave the hive and return with an array of brightly coloured pollen, we are also helping increase their population and rate of pollination in our neighbourhood. You can find my previous blog posts about Australian native bees here (Australian Native Bees) and here (Australian Native Stingless Bees). You can also see more wonderful pictures and bee footage here (My Adventures in the Real World).